Don't settle for a partial view of your patient's spine. See the view in which your patient experiences the problem -- sitting, standing, bending, or lying down. Knowing the full extent of pathology and the differences in anatomy between the upright and recumbent positions can be critical. Lie-down-only MRIs cannot detect pathology that is visible only when the patient is scanned in an upright position. A lie-down scan may also underestimate the maximum degree of pathology and miss its dynamic nature. 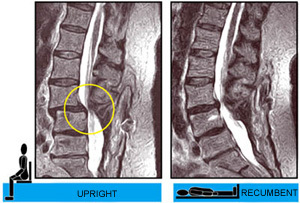 Only the UPRIGHT® MRI gives the complete picture of your patients’ problems. The combination of its 0.6 Tesla magnet and its full complement of advanced RF receiver coils and software features enables the Upright™ MRI to produce images of outstanding quality. Although patients can be scanned recumbent, standing, or bending, they are typically scanned in a comfortable seated position watching a 42” flat-screen TV throughout the scanning process. Because of the UPRIGHT® MRI’s unique magnet configuration, there is nothing in front of the patient’s face or directly overhead to create a “closed-in” feeling. Patients no longer have to suffer from claustrophobic reactions commonly associated with “tube” or “tunnel” MRI scanners, even some so-called Open MRI scanners. In fact, UPRIGHT® MRI users routinely scan patients that were unable to tolerate other MRI scanners or who simply couldn’t fit into them, including patients weighing as much as 500 pounds. 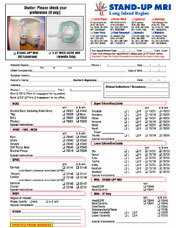 The UPRIGHT® MRI meets special needs as well. For patients who are physically unable to lie down, the UPRIGHT® MRI is the only scanner that can accommodate them. Young children are frequently anesthetized for their MRI scans in order to prevent motion artifacts. Since children can sit comfortably watching TV in the UPRIGHT® MRI, the motion problem can be eliminated, thereby avoiding the added expenses and risks of anesthesia. Finally, infants can be scanned risk-free, sleeping peacefully on their mothers’ laps throughout their scans.